Microsoft has said previously that its Anniversary Update and similar, major releases proceed in a phased rollout. Users waiting for Windows 10's Creators Update, which is expected to release soon, may need to be patient. Data released Wednesday by AdDuplex suggests that Microsoft’s Windows 10 Anniversary Update took months to roll out to users after it was released last August, and the same pace could apply to the Creators Update. In fact, Microsoft said Thursday that the rollout will indeed take place in a phased approach, with newer devices targeted first. Microsoft sources had told PCWorld that the rollout was deliberately slower than with the Anniversary Update, just to be careful. "We’ll iterate this process over a period of several months until all compatible devices running Windows 10 worldwide are offered the Creators Update," the company said in a blog post. 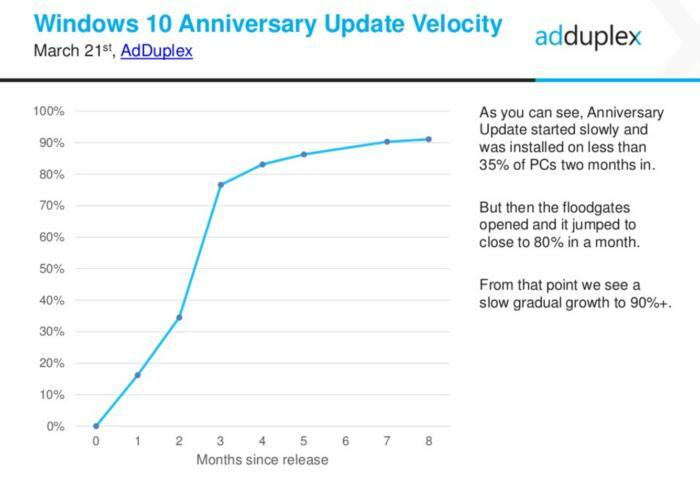 AdDuplex, which runs its own ad network and sniffs the platforms on which its ads deploy, said it took about 4 months for 80 percent of Microsoft’s user base to migrate to the Anniversary Update, once Microsoft started sending it to users on August 2. Just a third of Windows users had received the update after two months, the firm found. “The Windows 10 Anniversary Update is being rolled out to Windows 10 PCs across the world in phases starting with the newer machines first,” Microsoft said in a blog post officially announcing the AU rollout last August. If you want to receive updates more quickly, Microsoft’s traditionally offered an easy way: Go to Settings > Updates & Security > Windows Update, and click the Check for Updates button. It may still take a few hours or days for your PC to successfully signal Microsoft’s servers, but you should receive it soon. This year, Microsoft will begin the automatic rollout on April 11, but you can manually kick it off even earlier, on April 5. Why this matters: Until the AdDuplex data was released, there was no information on the pace or scope of Windows 10's major upgrades. The Anniversary Update rollout's history suggests the average user may not see the Creators Update for many months, unless they actively hunt it down. Still, the data also shows Windows 10 users are marching forward fairly quickly and adopting new releases, which is a positive trend against Windows fragmentation. This story was updated on March 30 at 11:32 AM with additional details.